Buko Salad is a very popular dessert in every parties or occasion such as town fiesta, birthday parties, Christmas and New Year. A lovely tropical salad. 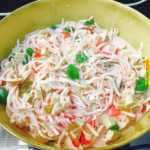 Mostly, The Buko Salad Recipe is prepared with young shredded coconut, canned fruits, cream and sweetened milk. In a bowl, combine the young coconut, kaong nata de coco, pineapple chunks and fruit cocktail. Stir gently. Add the sweetened condensed milk and light cream. Mix until all ingredients are well incorporated. Refrigerate for at least 4 hours or place in freezer for 1 hour. This video shows a variation of buko salad recipe.